We understand the difficulties faced in managing presentation across intranets, particularly within large organisations. You have a vast array of different types of content and a diverse range of user needs to accommodate within a single environment, this combined with the need to constantly refresh the user experience is in most case difficult or impossible. The quickest way to kill an intranet is an organisation resigning itself to the fact that their intranet is boring. Why waste such a valuable resource by allowing it to become tired and unengaging it can become an interesting and engaging tool? 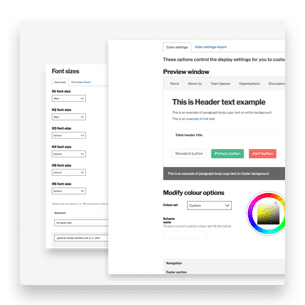 Retain control over the structure of the whole site and define where the text, images, menus, metadata, and widgets appear in relation to each other. Ensure your intranet fits in with your organisational identity and enhances user experience. Maintain the appearance of your intranet with flexible layout control to achieve the right look and feel for your organisation. Ensure your presentation management is up to date and appealing with our 3 key elements; Widgets, layouts and pane styles. Using our presentation management features you can achieve the type of intranet that users are excited to be part of. Additionally, our In Place Editor makes maintaining the appearance of your intranet easier than ever, by assisting you with achieving the right look and feel for your organisation. We offer all the widgets, templates, page layouts, and design aids needed to lay-out an intuitive intranet that’s easy to get around and a delight to use. Content authors can select from over 30 page layout types, ensuring the design of a page suits the content. The flexibility provided to your content publishers, while providing a consistent intranet experience for all users, is one of Invotra’s most impressive personality traits. We have a fantastic ‘out-of-the-box’ bank of over 60 widgets that can be dropped into any page layout to add further functionality and content. Our widget functionality is complemented by various styles, helping to fit widgets seamlessly into page layouts. Whatever the structure of your intranet, intuitive, common-sense menus are needed to help people navigate the intranet with confidence. Invotra offers a simple drag n drop menu building system for the intranet manager, and navigation menus can be adapted to suit the needs of your organisation. Distributed publishing – Our distributed publishing enables the delegation of publishing responsibilities across your organisation, cascading author, editor and publisher permissions from your on boarding team, to individual section owners and outwards through your organisation. Content types – Our Intranet offers multiple content types to meet your organisation’s publication needs. Our various content types include news, general information pages, manuals, forms, multimedia, lists, promotional content and policies plus the ability to create your own custom content types.